Stage of Forest is a public space designed by META-Project and located between a ski run and the forest. The surrounding area is characterised by delectable greenery in summer and secured by a dreamy white snow in winter. The triangle shape of the construction was chosen after an accurate examination of the site condition, to limit the effect for the current vegetation and to expand the view on the stage. 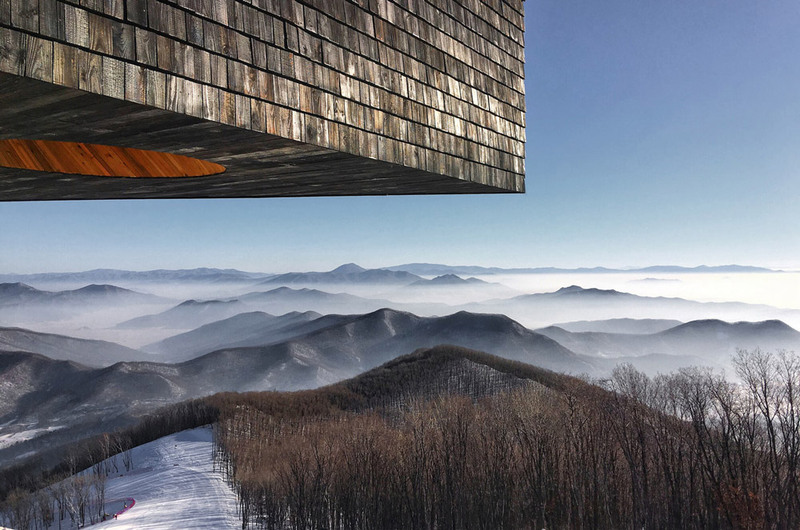 The whole stage resembles developing from the forest and utilizing it's roasted cedar shingles (Shou-Sugi-Ban) cladding to frame a poetic exchange with the Mongolian oak wood and the encompassing mountains and valleys. The structure joined harsh materiality with arousing shape. Seen from a remote place, the stage is a dark obelisk in the middle of nature. Come nearer, the reflection on the burned cedar shingles turns out to be faintly distinguishable, it even turns brilliant with the changing point of daylight. When the visitors reach the platform level, what opens up all at once is an incredible view on the Songhua lake. Surrounding you, the red cedar board divider has been left untreated and is striking in vivid shades, as opposed to the structure's dull wood outside. The structure is planned to incite individuals to explore their connection with the nature, and itself additionally turns out to be a piece of the nature.